Cuisinart, America's Leader in Premium Home Appliances, has created a lifestyle workshop, in partnership with Rustan’s, entitled “Soup Du Jour”, to launch its newest innovative product, the Cuisinart Soup Maker. This versatile machine makes hot soup, whips up smoothies, crushes ice and does much more. Soup is one of the most diverse and beloved dishes in a home cook’s repertoire, and has been a staple of kitchens around the world for centuries. Traditionally, soups of all kinds are prepared in stages: chopping vegetables, slicing meats, prepping and measuring herbs and spices, and of course, actually cooking the soup. Now, consumers can do all of this – even cooking – in the new Cuisinart Soup Maker (SSB-1). This innovative new blender utilizes patented technology that allows for cooking and stirring ingredients, which allows permits fresh homemade soup to be prepared from start to finish: the nonstick heater plate can be used to sauté ingredients, simmer and even boil soups, all of which can then be blended to the perfect consistency with the touch of a button. In addition, the blender is ideally suited for more traditional tasks like crushing ice and blending smoothies and cocktails. Cuisinart’s Soup Maker has numerous features that allow home cooks to make any soup, chowder or stew quickly and efficiently. The blender has 1000-watts of cooking power (with the blender alone, without the heater, being able to achieve a maximum of 500-watts) and a thermal, shock-resistant glass blending/cooking jar with a sturdy, wide-mouth design. This unique blender jar can hold 1.4 liters of hot liquids and 1.75 liters of cold liquids, with markings for each clearly visible on the jar itself. The dial allows users to choose speeds from one to four (one to two only for blending hot ingredients) and pulse ingredients to the desired consistency. The blender also has a countdown timer that can be set for up to 30 minutes in one-minute increments. In addition, a leak-proof rubber gasket holds the blender jar snugly in position for safe operation. Aside from the ability to cook ingredients, the Soup Maker has other significant design elements as well. The unit has high, medium and low temperature settings to ensure that any type of soup is brought to the proper cooking and serving temperature, as well as a stir function that gently mixes ingredients as they cook. The Soup Maker is also designed with a nonstick interior and cooking plate and is equipped with high-quality unique stainless steel blades with a unique design for thorough blending and ultra smooth consistency. 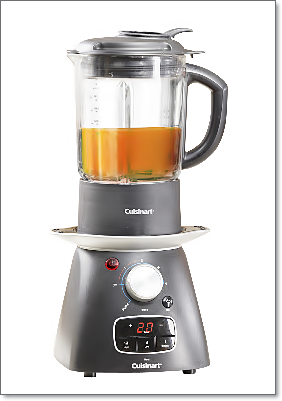 Cuisinart’s new blender offers a lot of convenient features, including an easy-to-read LED 30-minute countdown timer to allow for perfect timing, whether preparing a light carrot and ginger soup or a hearty corn and clam chowder. The blender also has a press-on lid with a tight-fitting seal to prevent leakage, which is equipped with vents to allow steam to escape during the cooking process. Additionally, the lid includes a removable measuring cup that allows home cooks to measure up to three ounces of ingredients to add through the lid opening created by the removal of the measuring cup. Lastly, all removable parts of the unit are dishwasher safe. For over 35 Years, Cuisinart has produced the very finest kitchen equipment so that cooks at home as well as professional chefs have the tools to express their creativity. From food processors to blenders, from coffee makers to waffle makers, griddlers to ice cream makers, plugged or unplugged, nobody covers the kitchen like Cuisinart. All Cuisinart products are engineered for exceptionally long life and designed to be easy to use as well as to give excellent performance day after day. That is why they have come to be regarded as the defining machines in their field by chefs across the world. Whatever you cook, cook it better with Cuisinart.